The Golden Boy up close. 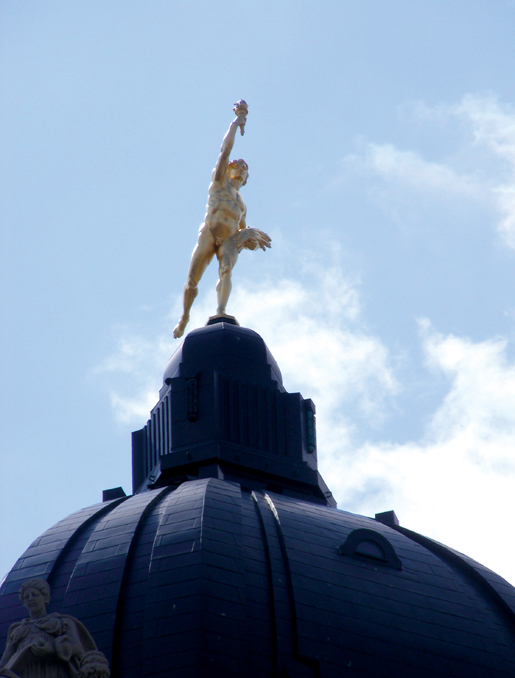 Poised atop the dome of the Manitoba Legislative Building, standing 5.25 metres (17.2 feet) tall—from the bottom of his bare feet to the tip of his torch—and weighing in at 1,650 kilograms (3,640 pounds), the Golden Boy is arguably the best-known cultural icon in the province. On a local level, this larger-than-life statue has been exceptionally popular. That should probably come as no surprise, for Manitobans pride themselves on being hardy, spirited and resilient. And right from the start, the Golden Boy showed he possessed these features in spades. Conceived, created and cast in bronze during World War I, the Golden Boy was the brainchild of British-born architect Frank Worthington Simon, who also designed the Manitoba Legislative Building. In 1911, the Government of Manitoba announced plans to construct a new legislature. It was a time of great growth and prosperity in the province. In 1881, when construction of the Canadian Pacific Railway began to open the West, thousands of immigrants started settling in and near Winnipeg. By 1911, Manitoba’s population had increased more than seven-fold, to 461,394. The province was rich in natural resources, and its capital was a hub for agriculture, grain trade, and distribution and wholesale enterprises. Manitoba politicians agreed that their new legislature should be a celebration of this emerging strength and vitality. Simon’s designs were judged as best reflecting this goal. Simon’s architectural idea paid homage to ancient civilizations and their leaders, and was filled with artwork and interpretations symbolizing the themes of justice, democracy, law and the origins of legislation. “Here you have no mountains, to which you can lift up your hearts,” he added. “So you have all the more need of great architecture to lift them up.” Simon was intent on creating a functional but inspiring building. His crowning glory would be a statue positioned at its highest point. Golden Boy meets golden prairie sunshine. Simon and Georges Gardet, a French sculptor well known for creating dynamic depictions of animals and human figures, had both attended L’École des Beaux-Arts in Paris. In the summer of 1915, Simon commissioned Gardet to create what would become the Golden Boy. Over the next 18 months or so, the two men exchanged transatlantic letters and drawings regularly. These documents, now preserved at the Archives of Manitoba in Winnipeg, provide a fascinating insight into their working relationship and the evolution of the Golden Boy against the backdrop of World War I. In designing his statue, Simon was influenced by Greek culture—specifically Hermes, Greek god of science and eloquence, and winged messenger to other gods. His sketch dated March 1916 depicts a youthful winged runner with a torch in his right hand and a wheat sheaf in his left arm. The figure’s left foot rests on a ball, while his right foot is in the air, as if in flight. Simon wanted the statue to personify Manitoba, a young, vibrant province on the move. From an artistic perspective, it was a fitting concept. But turning that concept into reality had its challenges. Typically, cast (as opposed to carved) statues are built around an armature, or shaft, which provides stability and wind resistance. The shaft for Simon’s statue was to be built in two parts. The upper part, which was to extend from the statue to the centre of the ball where it would fit into the coupling, was to be built in France. Simon’s engineer, Sven Bylander, insisted the upper shaft measure at least 125 millimetres in diameter. The lower part of the shaft would be built in Winnipeg, upon delivery of the statue. This approach would ensure a perfect fit. As an artist, Gardet was concerned that adhering to the dimensions proposed would result in the statue having a distorted left leg. At one point, he suggested he could design a figure standing on both legs. Gardet also expressed concern about obtaining steel of the quality required for the shaft. Metals and lathes used for shaping them were needed for the war effort; obtaining even basic materials was difficult. Eventually, the upper shaft was constructed in Chicago and shipped to France. As Simon explained in his memo to the Manitoba Minister of Public Works in December 1917, “It was impossible to obtain (the shaft) either in England or in France owing to war conditions.” Simon had also wanted the statue to be cast monolithically, from one piece of material without any joints or seams. However, given the metal shortage in France, several smaller pieces were used. The Golden Boy statue sits atop the Manitoba Legislative Building while a First World War memorial (foreground) is a reminder of war’s cost. Sources suggest Gardet modelled his creation on “flying” Mercury, a bronze sculpture by Flemish Renaissance master Giovanni di Bologna. Mercury was Roman mythology’s equivalent of the Greek god Hermes. However, Gardet’s finished work did not have a winged cap or winged feet, and the ball on which one foot was to be precariously positioned was eliminated. Gardet named the piece Eternal Youth. Eternal Youth had just been cast in bronze at France’s Barbidienne Foundry when the foundry was bombed. Surviving intact, he was rushed aboard a Canada-bound cargo ship. However, the ship was commandeered for active duty and Eternal Youth spent the rest of the war in its hull. 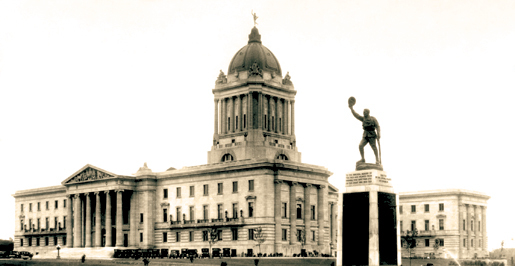 At war’s end, the statue travelled by rail from Halifax to Winnipeg and was hoisted atop the Legislative Building on Nov. 21, 1919. With the prairie sun shining down on his bronze surface, he became known as the Golden Boy. Like the Legislative Building, the Golden Boy is imbued with symbolism. A runner, he symbolizes Manitoba in motion. He faces north, looking toward Manitoba’s rich natural resources—minerals, forestry, water and hydroelectric power. The sheaf of grain in his left arm represents the fruits of labour, and the torch he holds high in his right hand, the spirit of enterprise and youthful enthusiasm. Some published articles suggest Simon was moved to put a torch in the Golden Boy’s hand on reading Major (later Lieutenant-Colonel) John McCrae’s poem, In Flanders Fields, specifically the words: “To you from failing hands we throw / The torch; be yours to hold it high.” McCrae’s poem, written after his friend and fellow officer, Alexis Helmer, was killed in the Second Battle of Ypres, was first published in the British magazine, Punch, in December 1915. Within months, it came to symbolize the sacrifices of those fighting in the war. Could Simon have read the poem before drawing his sketch in February 1916? Did he read it at a later date, thus furthering his resolve to create a torch-bearing statue? No reference to the poem can be found in documents attributed to Simon. However, in their transatlantic correspondence, Simon and Gardet regularly took time to applaud “les succès de nos admirables armées,” and to express admiration for the spirit and courage of Canadian and French soldiers. The final cost of the Golden Boy—including expenses related to designing, creating, casting, transporting and lifting him to the top of the Legislature dome—totalled $13,240.73. The Golden Boy went on to endure over 80 years of prairie winds, sweltering summers, infamous Winnipeg winters, and more than his share of predictable comments about his surviving Winnipeg’s weather in a seemingly unscathed—and unclad—fashion. Workers install the Golden Boy in November 1919. Repairs made during that time were all cosmetic. Sometime in the 1940s, with his bronze surface weathering, the Golden Boy was painted gold. In 1951, he received a more durable gold leaf coat. Newspapers reported 50,000 square inches of gold leaf would be applied in sheets measuring 31⁄4 square inches. Provincial treasurer Ron Turner promised the cost would amount to that of a “medium-sized car” and certainly “no more than $3,000.” On Dec. 31, 1966, a light was installed on the statue’s torch. 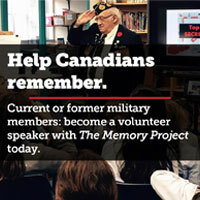 The intention was for him to truly shine during Canada’s upcoming centennial year, and thereafter. However, many Manitobans found the light—or at least the electrical cord dangling from it—distracting rather than illuminating. Then, in 2001, during a multi-year renovation of the Legislative Building, a section of its domed roof was removed so the Golden Boy could be inspected more closely. The examination revealed a dangerously corroded shaft. Rising warm air, plus moisture seeping through the holes drilled to fit wiring for the Centennial lamp, had taken a toll. Gamma radiation and X-rays confirmed the shaft had lost 10 to 15 mm (about half an inch) of its diameter. Photogrammetric surveying, which involved fixing reflective tape to the Golden Boy at strategic locations, and videoscopic examinations of his interior were used to create three-dimensional images. In turn, these provided information on how the statue was anchored, assembled and cast. Metal analysis and wind tunnel tests were also conducted. Manitoba asked for advice from the Royal Ontario Museum and California’s J. Paul Getty Museum. The statue was heavy, balancing one foot, high in the air in a notoriously windy climate, explained Robert Wiebe, an engineer with Dillon Consulting, the firm charged with overseeing the Golden Boy restoration. No other statue in the world presented the same challenges. The final diagnosis: the shaft could last another 20 to 30 years. But in a 100-year windstorm (a storm which has a one per cent chance of occurring in any given year), the Golden Boy could topple the equivalent of 24 storeys to the ground. The Golden Boy needed extensive restoration. 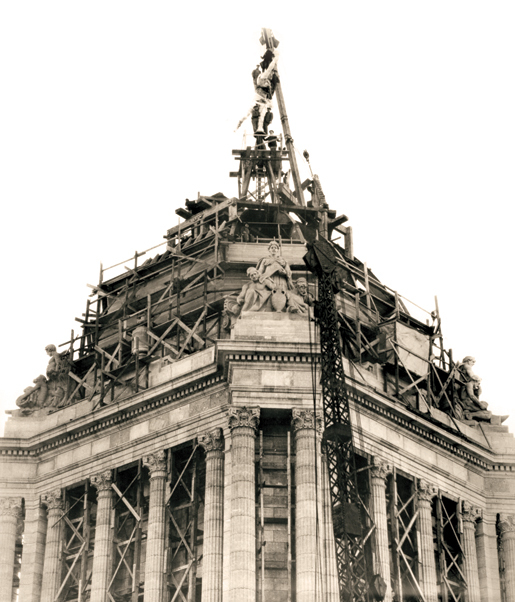 For the first time in over 80 years, the Golden Boy was coming down to earth, and leaving what was now considered his rightful post atop the Legislative Building. Encased in a specially built protective aluminum frame, and secured to a 300-foot crane, he was lowered to the ground on Feb. 9, 2002. He was then transported to the Manitoba Museum. Over the next three weeks more than 114,000 people—almost one-tenth of the province’s population—came out to get a close-up look at their Golden Boy. Then, what Manitoba Premier Gary Doer described as “the most unique restoration project in provincial history” got underway. At Pritchard Machine, a company specializing in metal fabrication and machining, the Golden Boy was disassembled into his original pieces and given a new shaft made from 17-4 precipitation hardened condition 1150 stainless steel. The alloy was chosen for its corrosion resistance, strength, compatibility with bronze, electrical conductivity and ease of fabrication. Internal connectors and the plug mooring the shaft to the statue’s left foot were replaced. And the holes drilled to accommodate the lamp cable were filled. Eventually the statue would be illuminated with floodlights. The Golden Boy was also fitted with a structural health monitoring (SHM) system. SHM civil engineering technology is commonly compared to personal health monitoring, where keeping an eye on one’s temperature, blood pressure and stress level can avert more serious health issues. In this case, movement and stress monitors that record the statue’s response to wind, temperature and other climate conditions were installed. The Golden Boy was one of the first heritage structures to be equipped with SHM components. The next stop was Bristol Aerospace, where industry facilities were large enough to accommodate the statue and crews working with hazardous lead paint. First, workers from Alpha Masonry, a company specializing in building restoration, blasted off the statue’s old gilding and paint with ground walnut shells. The shells were found to have the best combination of gentleness and cleaning power when tested against other products, such as ground glass, baking soda and crushed corn. After the statue was cleaned, four different colours of primer were applied. Varying hues would make any deterioration easily detectable; the final two applications—shades of yellow—would minimize contrast with the gold leaf finish. The primers were the same type used on the Golden Boy over 50 years ago. As they contained lead, they were applied by brush. Reportedly, the entire Bristol Aerospace painting crew participated in the process. For a crew accustomed to painting helicopters, and commercial and military fixed-wing aircraft, working on the Golden Boy was a once-in-a-lifetime opportunity. Community support for the Golden Boy continuously exceeded expectations. “Everywhere I go, I get asked about the Golden Boy,” said Steve Ashton, who as Manitoba’s then-government services minister was in charge of the restoration project. With interest running so high, Ashton declared the Golden Boy’s re-gilding would be a public event. The statue’s new micro-thin 23.75-karat gold-leaf coat was applied in a climate-controlled, see-through enclosure at the Forks Market, a popular gathering place situated at the junction of Winnipeg’s historic Red and Assiniboine rivers. On Sept. 5, 2002, the Golden Boy returned home. His restoration costs totalled $1.1 million. The re-gilding cost $34,000. The gold leaf cost $5,600, the price of a middle-sized car—a well-used, middle-sized car. The following month, Queen Elizabeth rededicated the Golden Boy during her Golden Jubilee visit to Winnipeg. On a recent visit to my hometown, I watched as people glanced skyward to catch a glimpse of the Golden Boy—just as I had done on countless occasions when I had lived in Winnipeg. His constant presence had been reassuring to me. But what did others find so special about the Golden Boy? No doubt, Frank Simon and Georges Gardet would be pleased. For almost 90 years, Manitobans and visitors from around the world have looked up to admire their Golden Boy. The architect and artist would probably be both gratified and intrigued on learning that state-of-the-art, 21st-century technology is now being used to help preserve and honour what has become an important part of Manitoba’s heritage.